Bubbles the Fish...yes, a FISH! This particular original design makes me squeeee with delight! In gorgeous sea blues and greens, my magnificent little fish has been heavily beaded with hundreds of shimmery Aurora Borealis coated glass, silver-lined Czech glass seeds and natural looking silver Swarovski Crystal Pearls. Bubbles is one-of-a-kind and makes a striking statement with formal wear as well as a unique accent for a casual look. Glamorous Luxury Jewelry. Striking Fiber Art designed in a distinctive manner. 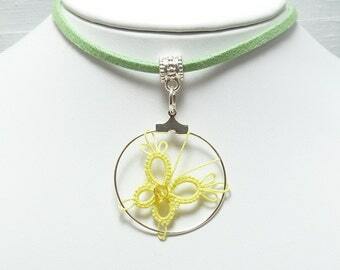 ~3-D fin is raised 0.50"
Tatting is a knotted lace technique that is very durable and firm. The hundreds of beads that are added to this design are both tatted into the work and handsewn. I received my item 2 days early! 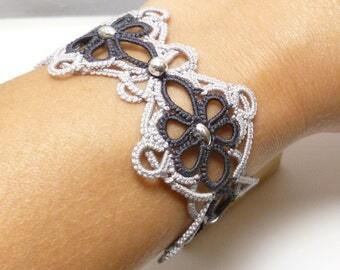 superb tatting and in the colors I choose. I will definitely order more from her. I highly recommend her products! This is a lovely piece. The tatting is perfect. Fits and adjusts easily. A long lasting purchase. I love these! Quality and shipped fast. Can you make items in different colors or sizes? I can create most jewelry in various sizes and have many different color options for thread, beads and metal finishes. Contact me if you are interested in custom work, bridal work or multiples of the same design. I am always happy to accommodate my customers as much as I possibly can. All J Kohr Couture designs are one-of-a kind and cannot be changed or duplicated. 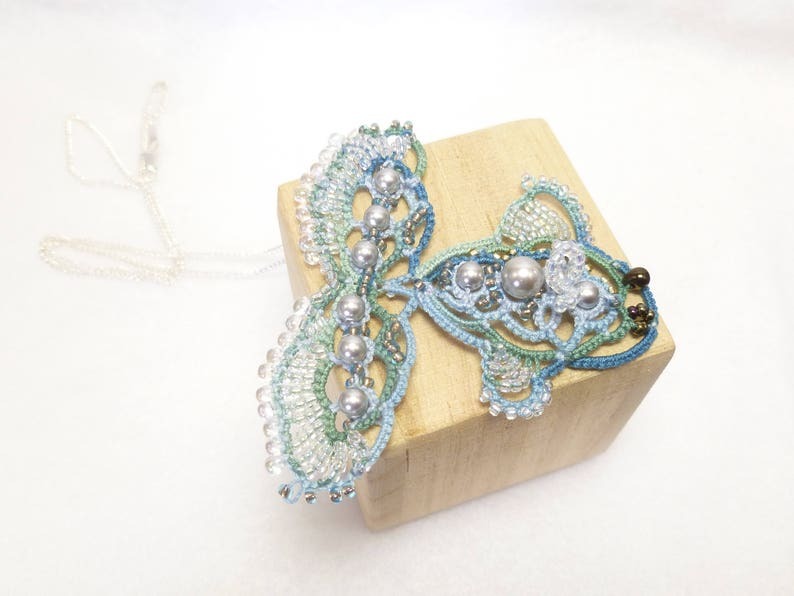 Shuttle tatting is a knotted lace technique that is very durable. It does not unravel like crochet or other types of lace. Many designs can be worn for years with simple care. how long does it take to shuttle-tat lace? 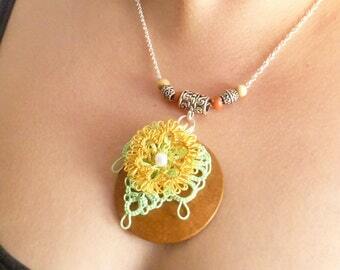 Shuttle tatting takes 3-5 times longer to create something of similar size that is crocheted. It is a process of tying tiny knots over and over with a small shuttles. Work is created in rounds or in rows. My elaborate J Kohr Couture designs can take days to design and create. Simple earrings can take up to an hour. All work is priced based on time. I can gift wrap any order and ship directly to the recipient. Just send me a note along with your order with the recipient's address and any note you would like sent to them! I am unable to fulfill wholesale orders due to the unique nature of my work. I can create large orders of items at a modest discount. Just inquire and I can tell you what I am able to do! Are your patterns available for sale? All Snappy Tatter original patterns are not available for sale or as a tutorial and are protected by International Copyright laws. I am proactive about asserting my rights to my work as an artist. I may provide patterns for sale at a later time. I ask everyone to respect my wish to protect my work. Thank you! Are your Printables available in PDF? Yes, just contact me and I will make any listing available as a PDF.